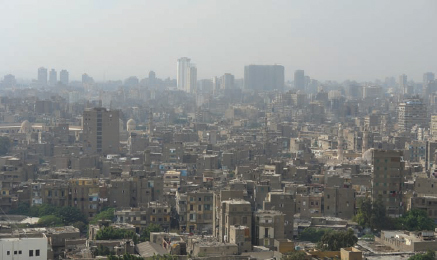 What are some disturbing statistics regarding air pollution in Egypt? The World Health Organization estimated that breathing the air in Cairo, Egypt, is the toxic equivalent of smoking 20 cigarettes every day. Damage to the Egyptian economy as a result of pollution is also troubling, with the World Bank noting in 2002 that five percent of the country’s gross domestic product (or about $2.42 billion U.S. dollars) are lost annually due to damages attributed to pollution. Cairo, Egypt, is one of the smoggiest cities on the planet.